Snow Day is a delightful, meaningful book. Yes, I said meaningful. How many books can you say that about? 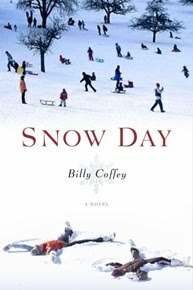 For starters, the premise is great — there is an unexpected blizzard and for the residents of a close-knit Virginia town, life is turned upside down. Peter’s kids are home for the day, as is his teacher wife, so, why not? Call in well! But then, Peter has no choice but to trek to the store for what he thinks is going to be an ordinary errand for necessities. That errand, though, is the basis for Billy Coffey’s storytelling, which he does magically, heart-warmingly, and meaningfully. Yes, I said it again. Meaningful. I found myself getting teary-eyed as I read about Peter’s encounter with the elderly couple who picked up — rescued — a beat-up, unwanted Santa decoration. I also got more than a little choked up when Peter witnessed the spirit of giving in the form of an anonymous Santa who shares the spirit of Christmas with a poor family he encountered at the Super-Mart. Don’t even get me started on the family meeting where Peter presents the idea of cleaning out their closets to donate clothing to those in need and stuffed animals to children whose houses have burned down. Try not to be touched by Peter’s 5-year-old daughter, who parts with Beary, a special stuffed animal that helped her get through tough times. For some, the most important facet of Snow Day will be its Christian theme. For others, it won’t make a difference. This book will touch your heart and make you feel good about people, about life, and about being alive. Snow Day will be a wonderful gift (or addition to your library) this Christmas. It will be the go-to book for a snowy afternoon, curled up on the couch with a cup of hot chocolate.